How can I apply for a job on Naukri? Can I still apply to a job if I haven’t registered on Naukri? When can I expect a response after I apply to a job? Can I apply to more than 1 job at a time? How do I track my job application? What does it mean when I get a message saying, “The status of your application has changed”? Do I need to pay to apply to a job or get an interview call? / Recruiters are asking me to pay to schedule interview for job? Once I have selected a job, do I have an option to save it for a later apply? Do I have an option to reapply for a particular job vacancy? How many jobs can I apply to in a day / month? Can I contact the employer regarding my application? 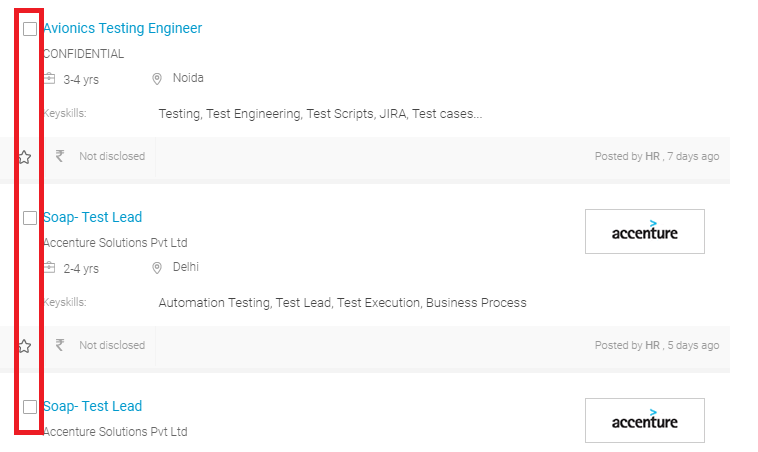 I searched for jobs on Naukri but I could not find one matching my profile. What should I do? When I try to apply to certain jobs, I am re-directed to another site in some cases. Why does this happen? How can I apply for a job on Naukri? Register on Naukri to create a Naukri profile. Fill details in your Naukri profile. These details will be shown to the recruiter when you apply for a job. Based on these details, the recruiter may shortlist you for an interview. Search for jobs. Click on a job posting to which you would like to apply. 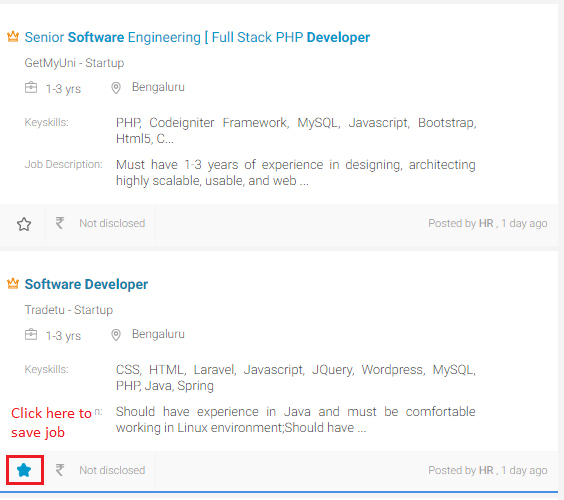 Click Apply button to apply to the job with your Naukri profile. If the recruiter needs some extra information before accepting your application, a questionnaire will be displayed. Fill this questionnaire for your application to be successful. Can I still apply to a job if I haven’t registered on Naukri? Yes, you can apply to jobs without registering with Naukri.com. However, it is recommended that you register before applying as this would let you avoid filling a long application form every time. 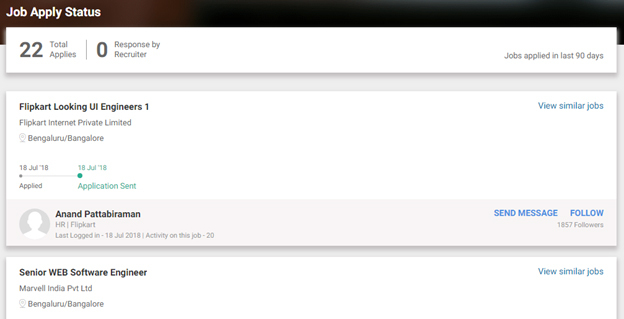 You can apply to jobs with a single click. When can I expect a response after I apply to a job? Naukri automatically sends all applications made by you to the Employers posting the Jobs. Thereafter, it is up to the Employer to respond to your Job application. Naukri is just a platform that lets you discover Jobs and Employers to receive your applications. However, you can track the status of your application on “Application Status” page. On mobile, you can see this in the “Applied Jobs” screen. Can I apply to more than 1 job at a time? How do I track my job application? After you apply to a job, you will see a success message on the screen. We will also send a confirmation email to your registered email address. In addition to this, you can view all the jobs you have applied to under the ‘Application Status’ section on the website. This section shows the status of the job application. You can see statuses such as ‘Application Sent’, ‘Application Viewed’, ‘CV Downloaded’, ‘Shortlisted’, ‘Job Expired’ against your application. Tap the hamburger icon at the top left corner of the screen to open the menu. What does it mean when I get a message saying, “The status of your application has changed”? When you get a message saying, “The status of the your application has changed”, it means that the status has moved to one of the above statuses. No. You can apply to jobs for FREE on Naukri. Note that genuine recruiters do not ask for money to schedule interviews or offer a job. If you are receiving such calls or emails, beware as this might be a job scam. We regret that sometimes, despite our best efforts, false job postings are listed online, and non-existing job offers are sent via email to illegally collect personal information and/or money from unsuspecting job seekers. Please note that Naukri.com does not approve of, or represent any employer or recruiter sending such fraudulent communication, which in fact are a violation of the Terms and Conditions. In such cases, we remain vigilant every day - When we receive complaints from Jobseekers about fraudulent or suspicious emails, we promptly notify the concerned employer client and, if necessary, block them from using our services. Report such cases to compliance@naukri.com. Before you respond to such communication, we suggest you to do a discreet enquiry and be sure to verify the legitimacy of the employer with whom you are interacting. Read our Security Notice to know more. Once I have selected a job, do I have an option to save it for a later apply? You can always save a selected job and apply later, if you are not sure of an immediate apply OR if you have crossed the limit of your daily quota of 50 job applications. To save a job, click on the star icon on the job listing to save the job. Search for jobs or view Recommended Jobs. To the left of any job posting, click the star icon to save the job. To remove the job from Saved Jobs, tap the blue star icon again so that the star is not colored blue. This will remove the job from Saved Jobs. How many jobs can I apply to in a day / month? You can apply to a maximum of 50 jobs in a day and a maximum of 150 jobs in a month. This quota gets reset on the 1st day of the month. Can I contact the employer regarding my application? If the recruiter has provided her contact details and asked you to contact her through the job description, you can definitely contact that recruiter. In some cases, the recruiter mentions the contact details in the job description. 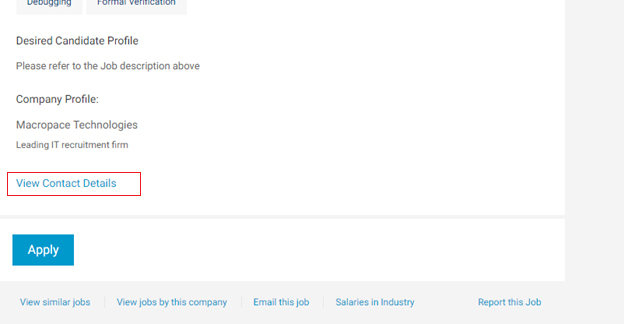 You can click on ‘View Contact details’ below a job description. 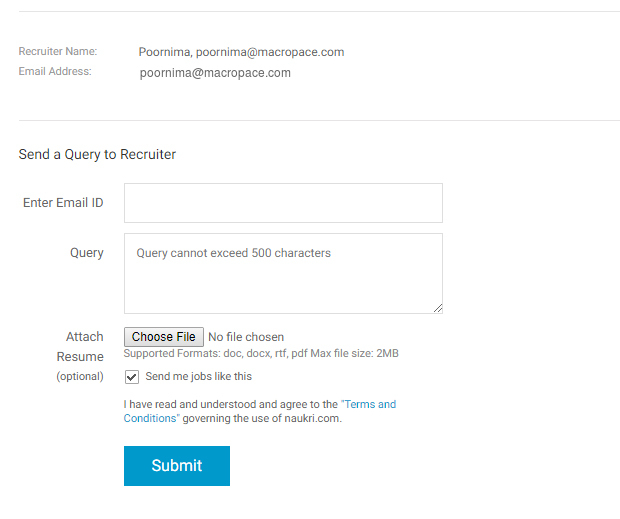 Here, you can send a query to the recruiter directly from Naukri. You can track this conversation on the inbox of your Naukri registered email address. If the recruiter has not listed their contact details freely, you can contact them through our Paid Service “Recruiter Connection”. 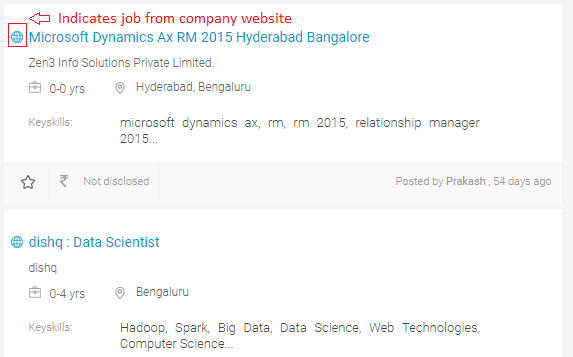 I searched for jobs on Naukri but I could not find one matching my profile. What should I do? When I try to apply to certain jobs, I am re-directed to another site in some cases. Why does this happen? In order to provide jobseekers with all the best opportunities, Naukri aggregates jobs from across the internet. This enables you, as a job-seeker, to search all relevant open opportunities from a single platform. These jobs are originally posted on the websites of various companies. While applying to these jobs, you must visit the website where the job has been originally posted. You are advised to use discretion while applying to jobs or sharing your information on non-Naukri websites.